8.30 am - 05.00 pm Register/Check in. 05.30 pm Evening chanting /listening Dhamma talk. 07.45 pm Relaxing, have a drink. 1. * To make a request for Vipassana Meditation at Bhodhipakiyadham Dhamma Hall. in other forms of meditation besides Vipassana meditation have to receive a lecture. 2.2 Women have to receive a lecture at insight meditation hall. 03.30 am Wake-up/ contemplation of routine activities. 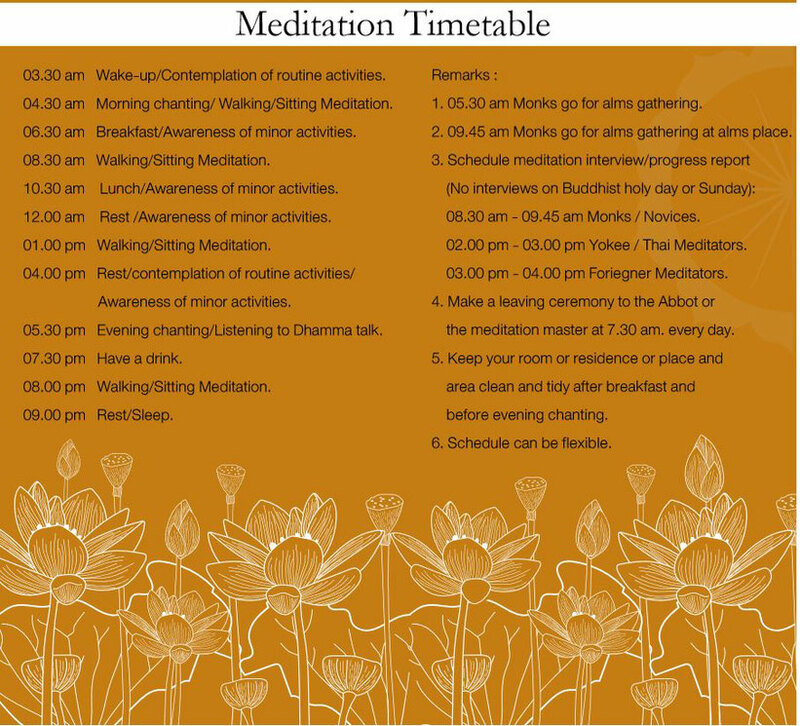 04.30 am Morning chanting/ Walking/Sitting Meditation. 06.30 am Breakfast / Awareness of minor activities. 10.30 am Lunch/ Awareness of minor activities. 12.00 am Rest / Awareness of minor activities. 04.00 pm Rest /contemplation of routine activities /Awareness of minor activities. 05.30 pm Evening chanting/listening to Dhamma talk. 07.30 pm Have a drink. 09.00 pm Rest / Sleep. 1. 05.30 am Monks go for alms gathering. 2. 09.45 am Monks go for alms gathering at alms place. 8.30 am - 09.45 am Monks / Novices. 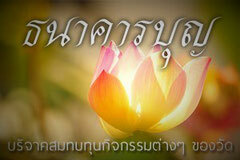 02.00 pm - 03.00 pm Yokee / Thai Meditators. 03.00 pm - 04.00 pm Foriegner Meditators. 4. Make a leaving ceremony to the Abbot or the meditation master at 7.30 am. every day. 5. Keep your room or residence or place and area clean and tidy after breakfast and before evening chanting. 6. Schedule can be ﬂexible.